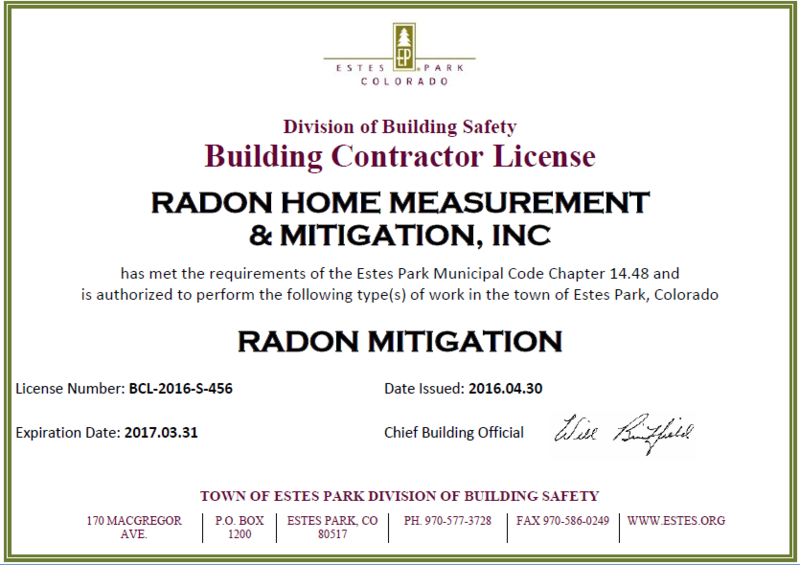 Radon Home Measurement and Mitigation in Colorado in Fort Collins, Loveland and Larimer County, mission and latest projects. On behalf of Village Gate HOA and residents I would like to thank you for the presentation at our annual meeting! The information and discussion were very useful. TIP: It is important that radon tests are done during “closed-house conditions” of the home, meaning windows on all levels and doors to outside are closed, except for going into and out of the house. In the Summer ‘whole-house AC units’ can be operating on Auto, but ‘window AC units’ should not be used during the test. 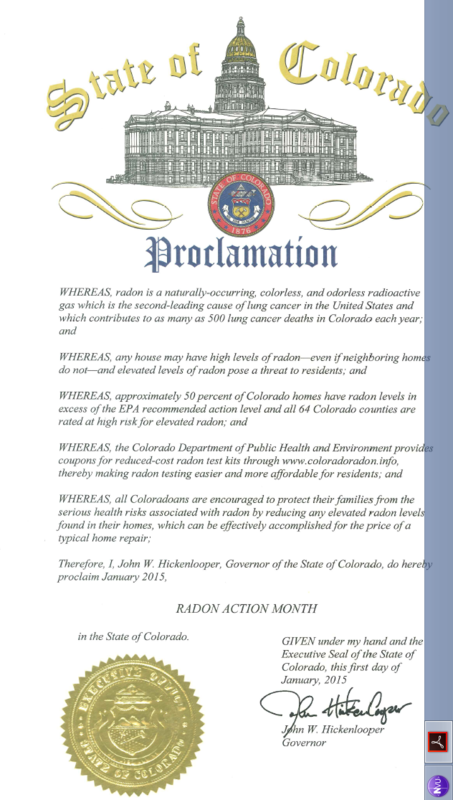 December 28, 2017 January 2018 will be Radon Awareness month in Colorado and in all of the United States. The State has written a Proclamation to this effect. 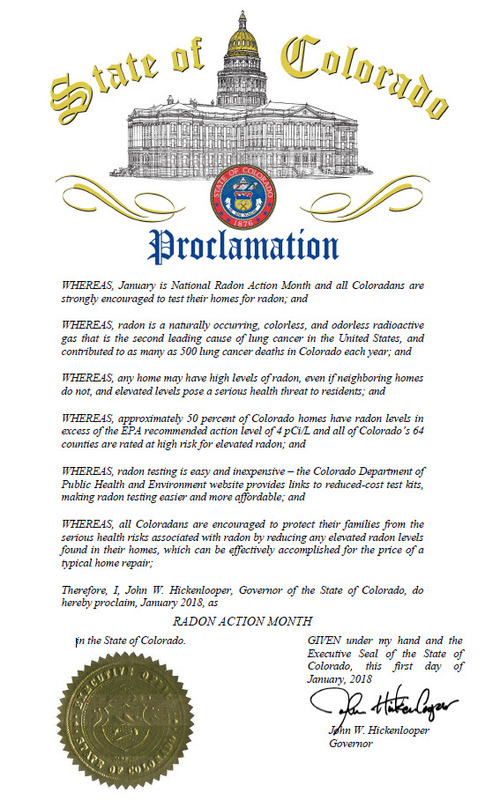 The Colorado Department of Public Health charged with the Radon issue will send out a press release in January with this proclamation to the public. Click on the following image to read in detail: Signed by Governor John Hickenlooper. Sept 1, 2017 Dr. Moorman renewed his membership with the AARST. 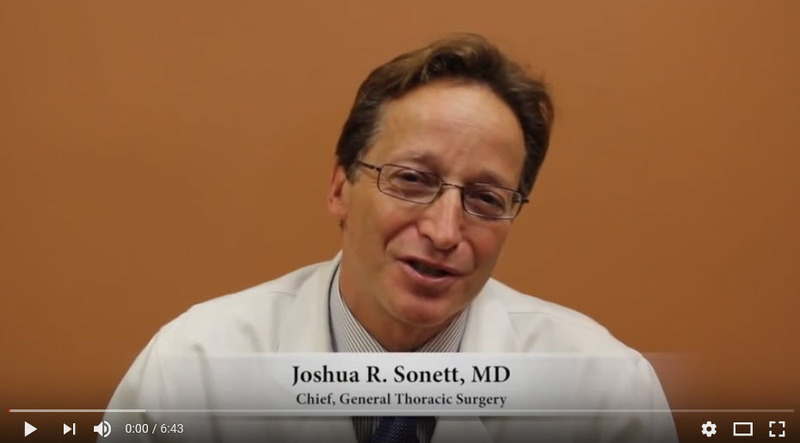 he has now been a Professional AARST member for 18 years. July 14, 2017 Today we were working in Estes Park near the Rocky Mountain National Park where we saw many hummingbirds around a feeder in the backyard. Here are two pictures made by Sherie S.
July 1, 2017: RHMM uses a State Licensed electrician for its electrical work and our AARST-NRPP certified owner estimates and installs the radon mitigation systems himself. 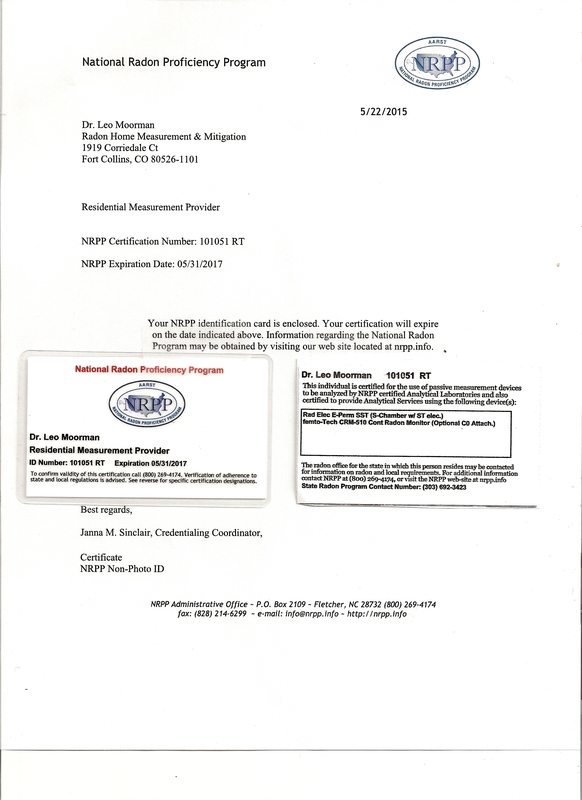 The new NRPP certifications for testing, mitigation and for RHMM as a radon testing laboratory have recently been received again for the next two years. 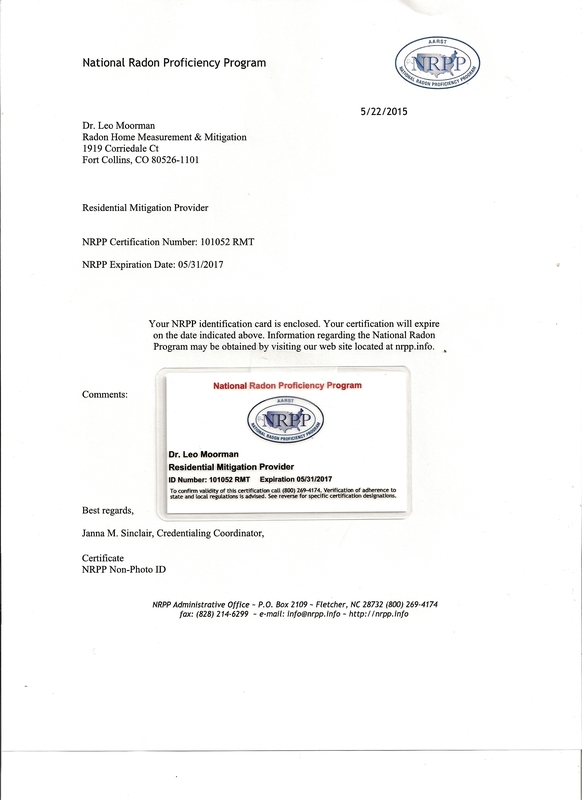 Our owner has been NRPP certified for the last 18 years, continuously. January 4, 2017 January is Radon Awareness month. In Colorado the State has written a Proclamation to this effect. Click on the following image to read that Proclamation in detail: signed by Governor John Hickenlooper. November 12, 2016. Today a local Home Inspector reported to us they have found two Active Soil Depressuirization Radon Mitigation Systems in the area that did not penetrate the concrete slab. These systems cannot work properly. We have found some over the years as well. This could have been detected immediately after the RMS installation if proper radon testing with closed house conditions following applicable EPA or AARST-ANSI standards had been done. When in a real estate transaction we recommend buyers always conduct their own additional test when they start living in the house. October 16, 2016. From Tomorrow our access to Estes Park is going to be limited because the Thompson Canyon is closed for travel for many months until May 2017. Access via Highway 36 from Fort Collins will add substantial miles and time. September 18-22, 2016. Dr. Leo Moorman visited the International Radon Symposium in San Diego, CA., organized by AARST and jointly held with the CRCPD. He gave a course for advanced mitigators on Sunday, allowing the students to earn 8 hours NRPP-CE for re-certification. He also delivered two invited scientific presentations later in the week during the Symposium. The two presentations will be published as contributions in the peer reviewed proceedings of the Symposium. August 31-September 2: RHMM deployed short term radon tests at an educational institution in Estes Park following the "Schools and Large Buildings" guidance. Proper testing required 23 radon test devices for this facility. August 24-26, 2016 with temperatures cooler than most of the Summer, RHMM is measuring radon levels in 80 apartments locally, and finishing up with 14 final tests at the Air Force. July 24, 2016 RHMM is starting this week to mitigate 10 Large Buildings, each with 8 apartments located in Fort Collins. July 20, 2016 We finished a large survey with 470 radon tests at the F.E. Warren Air Force base in Cheyenne, WY. All newly built housing for personnel must be tested within the first 5 years of occupancy. The report shows in detail that we passed all the required Quality Assurance and Controls that are needed in case of such a large survey. That means we proved that the radon tests were sufficiently accurate to make mitigation decisions. July 9, 2016 The proof of new membership of AARST is in. This is the official National organization working hard to promote (1) education and proper insurances for its members, (2) administer the development of National radon standards and (3) administer the AARST-NRPP certification program for Testing and Mitigation and (4) organize a yearly National Symposium for its members which in September 2016 will be held in San Diego. AARST also has members pledge (5) they abide by proper industry and busines ethics as they deal with the public and promote the risk reduction of such a sensitive issue as lung cancer causing radon gas. At RHMM we are proud our president has been a member of AARST for the last 16 years and has actively helped develop and improve the organization via a past two term National Board membership and by cooperating in standard writing committees and the review committee for the Symposium publications. 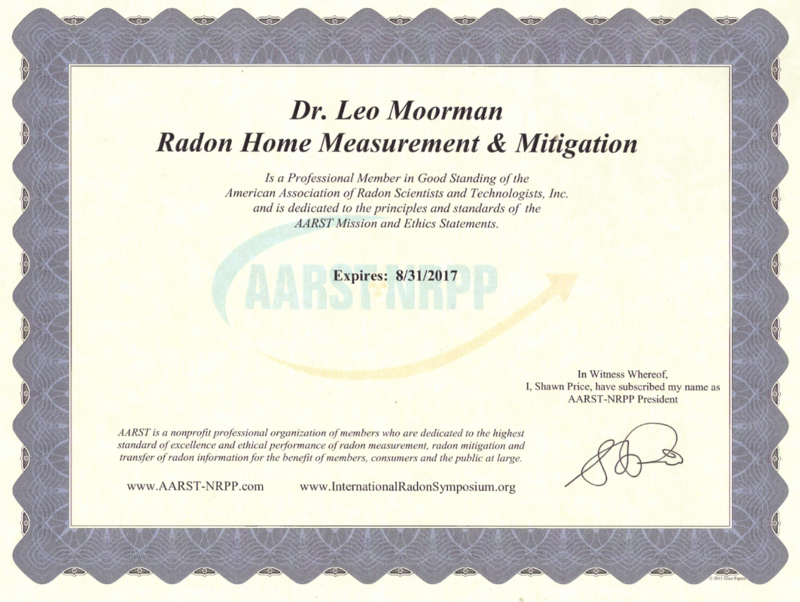 This is a very valid organization to the public by that it improves the trust in radon testing and mitigation when performed by certified AARST-NRPP members, especially in otherwise environmentally unregulated states such as in Colorado and Wyoming and others. April 30, 2016: We became a licensed contractor for Estes Park, We have also had for more than a decade a business license for Estes Park. Nevertheless, the contractor license is a new requirement for every contractor operating in the Town of Estes Park in Colorado. December 7, 2015 Here is a Christmas shopping idea: A gift of a radon test from parents to children can be a perfect, economical and easy gift even if the home has been tested in the past. 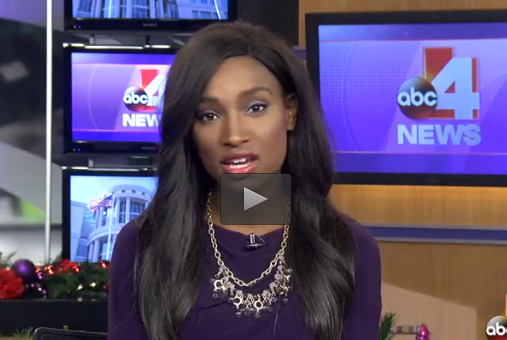 Such a gift for now or January 2016 would contribute to your family's future health. The Environmental Protection Agency has made January the National Radon Protection Month and recommends testing a home for radon regularly whether a radon mitigation system is installed or not. November 26, 2015 Update of USA Building Codes related to radon system requirements: Currently 8 states have radon in new home construction Code adopted. This is either as App. F (MD, MI, WA,), App. 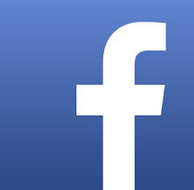 F or CCAH (MA), and/or an Amendment of App. F (IL, MA, MN, OR), or wrote their own Code (NJ). In addition there are 3 states with adoptions that are not statewide: App. F (FL, VA, local only) and ASTM 1465 (ME, if builder incorporates RRNC). In addition , Colorado is a State with decentralized building code adoptions by the individual municipalities. As an example, Fort Collins and Larimer County (and many others) have App. F requirements. Check your local building Code department for details. November 25, 2015, the evening before Thanksgiving day. Rocky Mountain PBS showed "Einstein's big idea. The story behind the world's most famous equation, E equals m c squared." An educational story about the discoveries that lead to the understanding that energy and mass can be converted into each other. 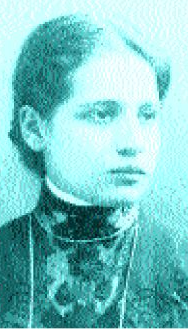 It also explains Lise Meitner's role in the discovery of man made nuclear fission (at the time misclassified as "fusion"). With this we mean that she was the first human to understand that atomic nuclei had been split in the laboratory during an experiment and used Einstein's equation to proof that this is indeed possible. It also mentions the rough deal she got by her immediate colleagues that is now well recognized. Click on pictures below for two different sources. (The discovery is depicted 1 hr 49 min into the movie). 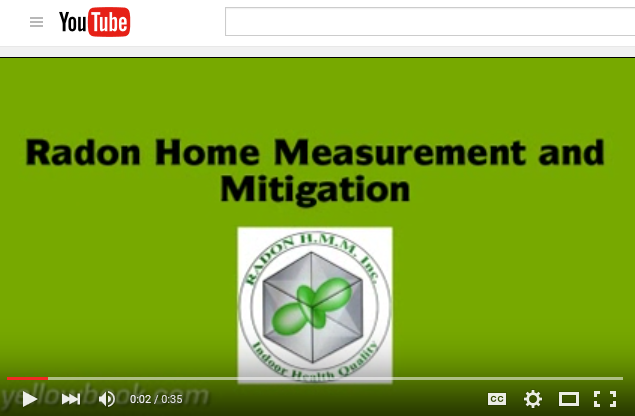 STARTING POSITION IN RADON MITIGATION NOW AVAILABLE. 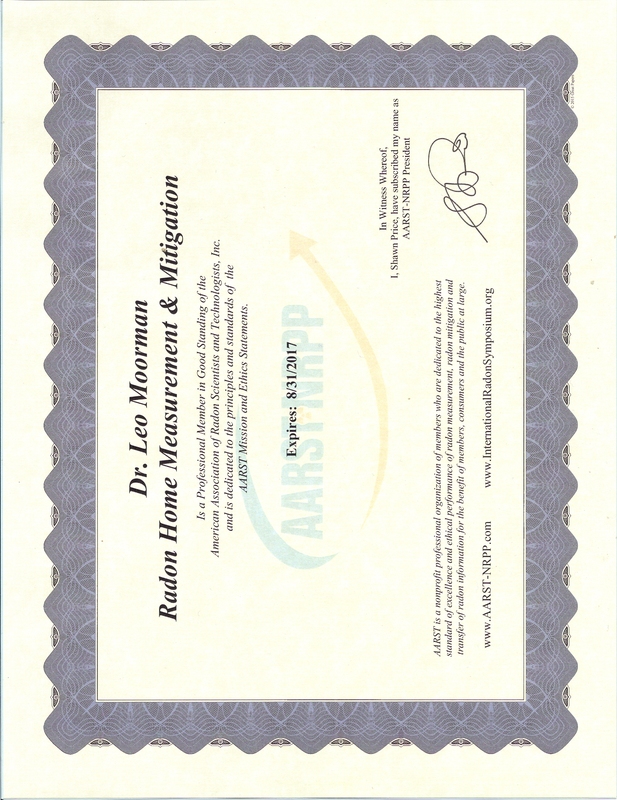 Radon Home Measurement and Mitigation (RHMM) performs radon testing and radon mitigation of single and multi-family homes as well as radon testing and mitigation in commercial or business locations, and delivers radon education to interested groups and the public. RHMM also helps with radon issues emerging during real estate transactions, helping real estate brokers, buyers and sellers to understand and deal with what may be a serious environmental health issue in a home. Our goal is to identify those places that represent a high radon exposure to the general public in residential, commercial and business environment and, after verification of an increased health risk, to fix the problem. Furthermore RHMM works with home owners, contractors and builders by pre-screening a building site before construction for its ability to show a radon risk concern after completion. 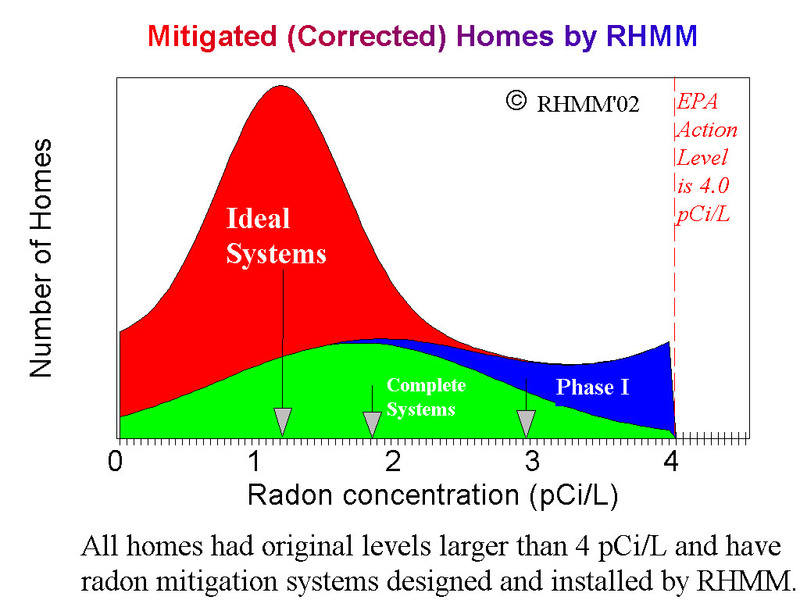 If this radon risk analysis shows a predicted high concentration of radon, RHMM can install an effective pre-mitigation system in new home construction. 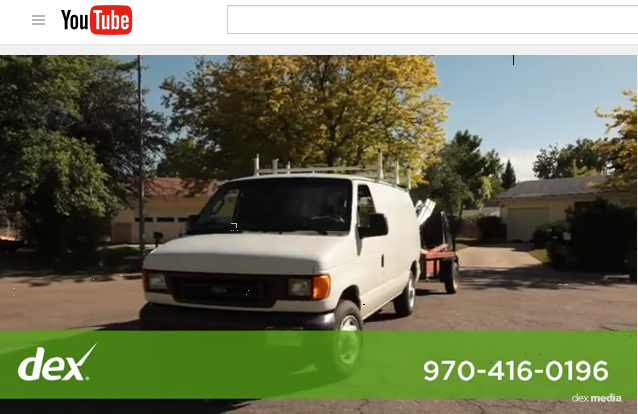 RHMM, located in Fort Collins, can solve radon problems anywhere in Northern Colorado or Wyoming. November 21, 2015: First mandated, residential radon testing during Real Estate transactions in a local municipality in the USA has now been adopted. The Montgomery County council (Maryland) decided last Tuesday unanimously to require testing of each house for radon by a Seller during a real estate transaction and that the results be provided to the Buyer. The Washington Post, November 17. November 15, 2015: Every year in the USA 21,000 people acquire radon related lung cancer according to the EPA, which means an average of 58 people per day. Most of these lung cancers are preventable if all the houses the affected people had lived in during their lifetime had properly working radon mitigation systems installed. In addition the EPA advice is to test homes with working radon systems regularly, such as once every two years, because the radon entry pathway into a house can change over time. 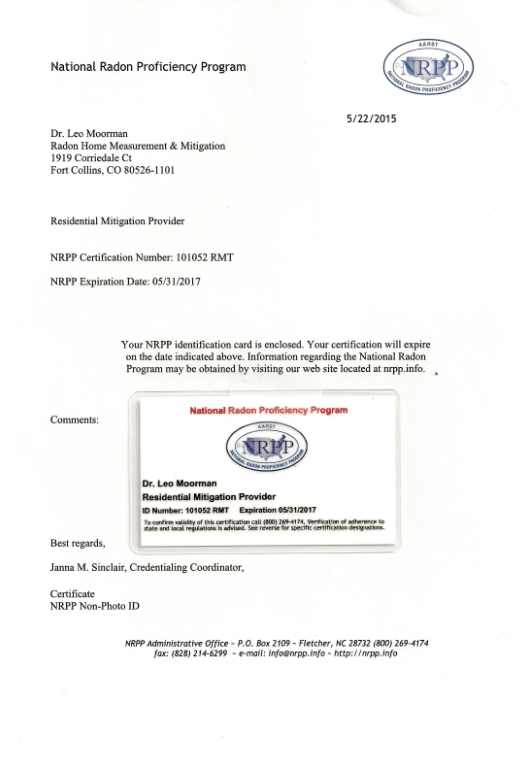 November 8, 2015: RHMM installed quality radon mitigation systems in the last two weeks in Fort Collins, Loveland, Estes Park, Livermore, all located in Colorado, as well as in Lander, Wyoming. We also helped two new mitigators pass the practical requirement for their NRPP mitigation certification. September 20, 2015 Our president Dr. L. Moorman taught a course entitled "Advanced Techniques For Radon Mitigation Systems" at the Bloomington, MN, AARST Symposium to a well attended audience. 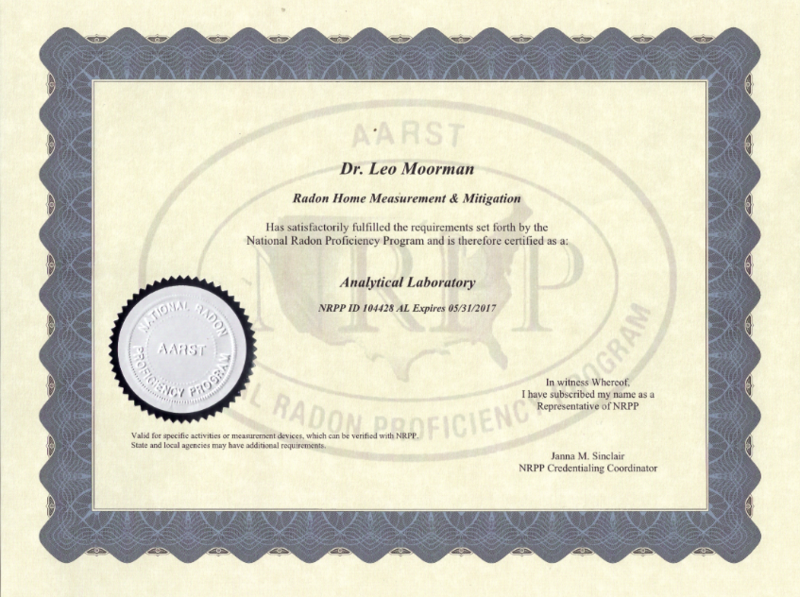 Experienced mitigators were able to earn 8 hours continuing education with this course under the AARST-NRPP program, the longest running professional radon certification program in the USA. In all, 56 students passed the exam and earned a certificate. Kudos to all! December 30, 2014 Mae Kaene dies at 107 years old. She was the last of the surviving group of radium dial girls that painted with radium on wrist watch dials to make them glow in the dark for the US Radium Corp in the early 1920's. She survived likely by quitting her job after a few days because she did not like the "taste of radium". 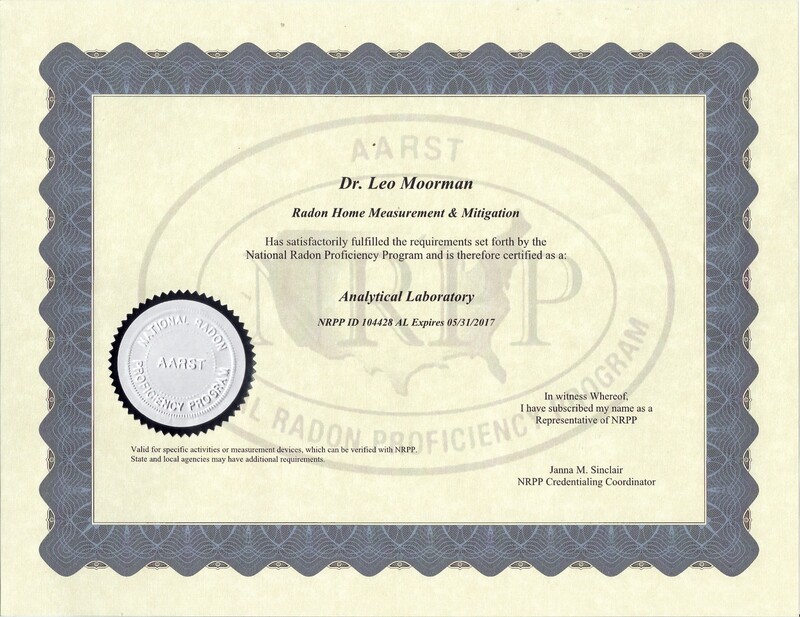 December 14, 2014 A new course entitled "Advanced Techniques For Radon Mitigation Systems" is approved by the NRPP-AARST for continuing education credits (8 hours CEU) for radon mitigators. 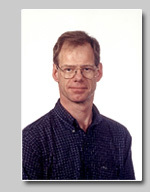 The course will be given by our president Dr. L. Moorman. For more course information, locations and dates or if you are interested to bring this course to your own State program write us by using the "contact us" button at top right and use as subject title: "ATRMS-course". 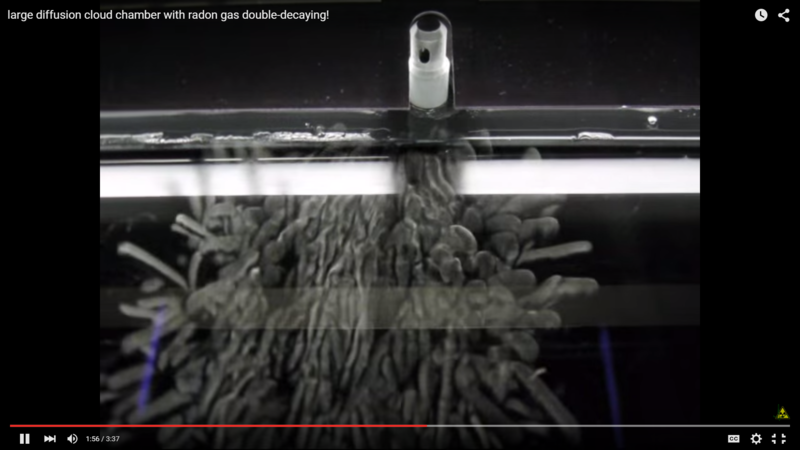 December 12, 2014 If you are interested in historically important events on radon, watch the educational video by clicking on the link at the bottom of this column about the discovery of the element radon (Radon-222). In the last part of the video you can view its radioactivity in an "ionization chamber" with an explanation what you are looking at (Thoron=Radon-220). 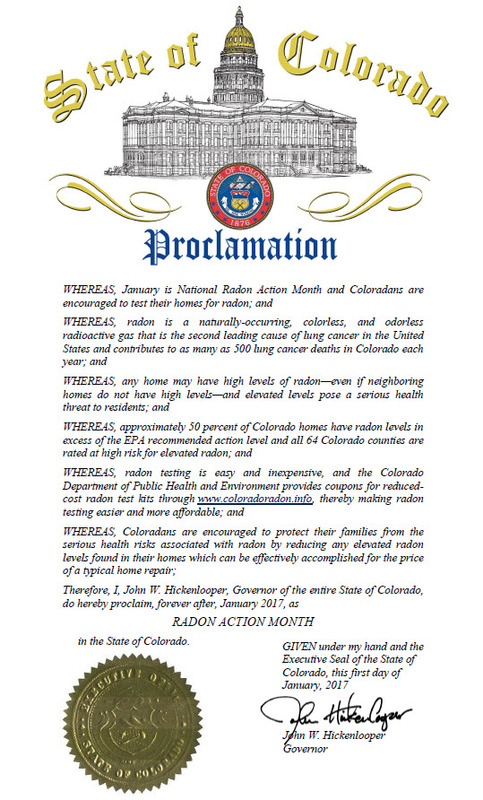 April 11, 2014 The Colorado Department of Public Health and Environment (CDPHE) has given us the information that currently 22 municipalities in Colorado have a Radon Code. This has been steadily growing since Aspen in 2003 and Fort Collins in 2005 started this trend. March 31, 2014 New data (CDPHE) have revealed that twelve Colorado Counties previously considered to be at moderate risk for radon exposure have been upgraded to the high-risk category. This means all 64 Colorado counties are now categorized as Zone I, which is the category with highest average radon following the EPA classification. When a house is at or above 4.0 pCi/L, the USEPA recommends mitigation. Spring is here: this is a good time to do a radon test. Although you need to know that a proper short term (>=2 days) test is conducted with outside doors and windows closed, except you can live there and may open doors to go in and out of the home, of course. 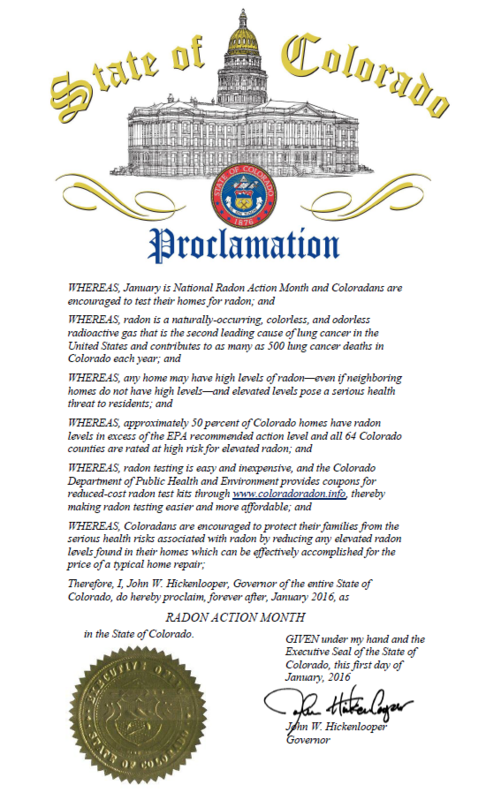 Federal Radon Awareness Week is here according to The Surgeon General. Health agencies throughout the United States have joined forces to promote awareness of the leading cause of lung cancer for non-smokers. The American Lung Association Centers for disease Control, and National Cancer Institute all agree the radon is a national health problem and encourage radon testing during the October awareness drive. June 2, 2013, More good news: After more than two thousand years a “weak version” of the ancient mathematical riddle in number theory, Euclid’s “twin prime conjecture”, is said to have been proven. Yithang Zhang, also known as “Tom” around the campus of University of New Hampshire has his paper accepted in a prestigeous mathematical journal., and has gotten instant rock star status under mathematicians. The conjecture states “There are an infinite number of primes that are only 2 units apart”, such as the numerical pairs (3,5), (5,7), (11,13), (17,19), etc. He is said to have proven it in his manuscript not for “2 units apart”, but instead for “70 million units apart”. Most importantly he said he contributes his success to “never giving up on a problem” and said he "got the idea while visiting a friend in Colorado on vacation". (Source: New Hampshire Union Leader, Sun, Jun 02). March 19 & 20 is National Radon Action day by the organizations AARST, NRPP, and CanSar. This is an event focussed on the need to bringing more attention to effective radon policy. February 28, 2013: Fort Collins Chamber of Commerce holds Red Carpet event for Radon Home Measurement and Mitigation, Inc. Dr. Moorman, President and Founder of R.H.M.M. gave an inspiring power point presentation before the Ambassadors of the Chamber, explaining what Radon is and how his company has saved now more than 28 lives since it began installing mitigation systems in homes. February 4, 2013: HUD releases requirement for multifamily homes to test for radon following the AARST/ANSI Multi-family Home Standards, and if high, mitigate these buildings when an FHA loan is written. About 100,000 mortgages are involved every year. (January 1, 2005): Passive Radon Mitigation Systems are now REQUIRED by current Building Code in Fort Collins (first in Colorado) for New Home Construction of one- and two-family dwellings. 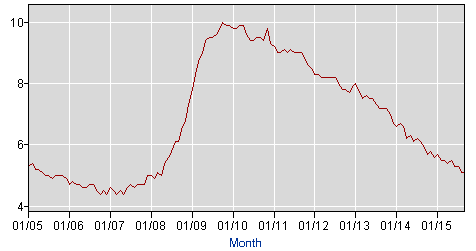 which was extended in 2008 to all multifamily dwellings. BAD ODOR OR MUSTY SMELL SOMEWHERE IN YOUR HOME: go to our MOLD page for more information. 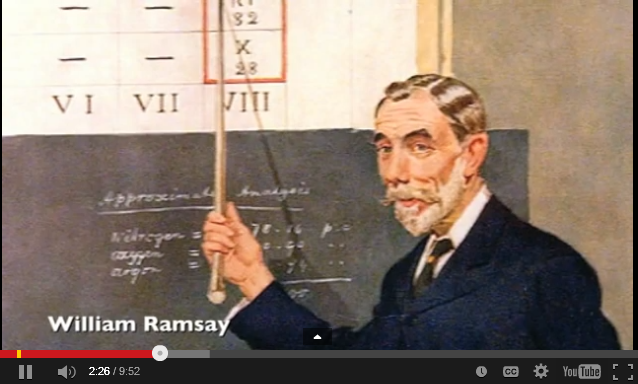 (3) Educational: On the history of radon discovery. A wonderful TED talk about the discovery of radon and the two famous scientists who competed over a century ago for the honor of its discovery. Rutherford vs. Ramsay. How did they discover it? By looking at the "ultraviolet (UV) light spectrum" and identifying it as different from other known ultraviolet light spectra, such as that from helium. 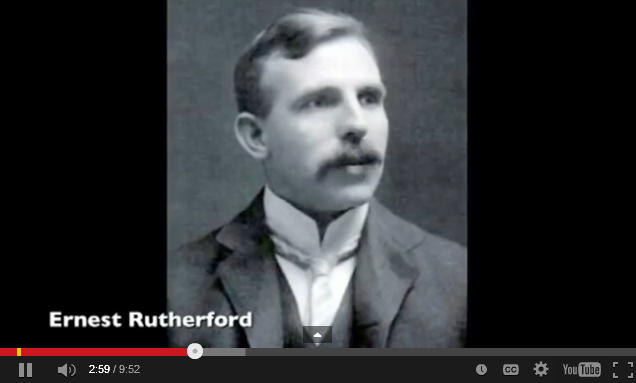 In this Ted talk the original ultraviolet light spectrum recorded by Rutherford is shown identifying the UV light spectrum of the then entirely new element, called Radium Emanation (Rutherford) or Niton (by Ramsay), which later became "Radon". (4) Particle decay, including that of a radon isotope (Radon-220) can be made visible as shown in this movie. A so called "diffusion cloud chamber" can show the alpha tracks in real life after radioactive decay when the ionizing alpha particles released by the atomic nucleus create milions of tiny (mist) droplets along their pathway through a supersaturated vapor. The alpha particles start with a daunting velocity of 20% of the speed of light. This instrument is called a "cloud chamber" since the principle on which it works is reminiscent of the process how clouds are formed in the sky. We focus on quality installations with maximum energy efficiency and thoughtful consideration to issues such as noise and aesthetics. The photo above shows an example of an interior system with the fan in the attic of the house. The photo on the right shows an example of an exterior mitigation system that was recently completed in a multiple family housing unit where no interior system was possible.